It’s been one year since I started the Literary Diaspora. It’s been a grand old time and I’ve been so excited about all of the stuff that I have received in the mail. I am very thankful to all of the artists and authors who have engaged in my little art game. Their work has been truly amazing and the results are beyond what I had dared to hope for. I was so lucky to have spent time again at the Macdowell Colony this past spring and I got great art cards back from the artists there. Amazing. Macdowell is also where I met my two conceptual art mentors, Rachel Perry Welty (from my first time there) and Matt Jensen. Their encouragement and sage advice has been really important to me. I was also very glad to have had the West Hollywood Book Fair do a little poster board of the diaspora at the festival this year. And with that simple conversation it was settled. I will continue to do the diaspora for the very long foreseeable future. And I am very excited about it. So, authors! Artists! Check your mail boxes! And also, if you haven’t sent your card back yet you can send your card back to me any time for now it is perpetual and ongoing!! And when things are scattered they sometimes take a long time to get back home. 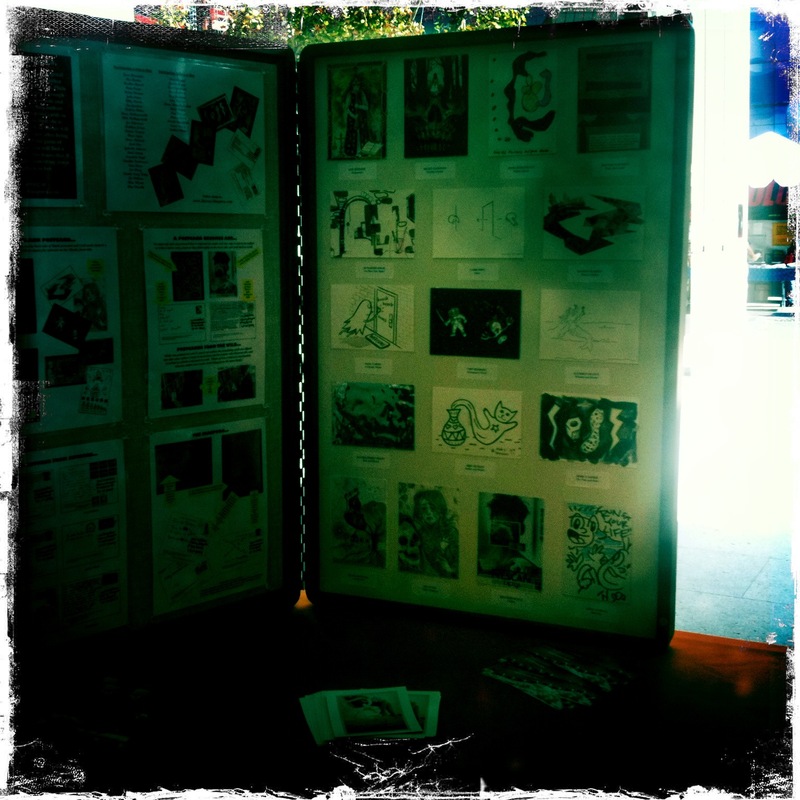 This past weekend the West Hollywood Book Fair was kind enough to have a little exhibit of the diaspora postcards. I was away for two months working on the draft of a new WIP graphic novel. It was pretty amazing and very productive. There I met a lot of great artists who did some postcards for me that I call the Art Camp sessions. People like Darina Karpov, Jesse Bercowetz, Kimetha Vanderveen, Sumakshi Singh, and Matt Jensen. Of course, I had no idea what was going on at home and arriving in my po box. I dared to hope that things would keep coming back. And I was not disappointed when I went to the post office today. I’m going to roll them out slowly so that they can be savored and it won’t be too much at once. I just started with Bruce Lynn’s Fresh Water. But what was great was that I got some writing back, too! I got microtexts from some pretty amazing people and I even got my first out in the wild shop dropped card from a total stranger! Amazing! 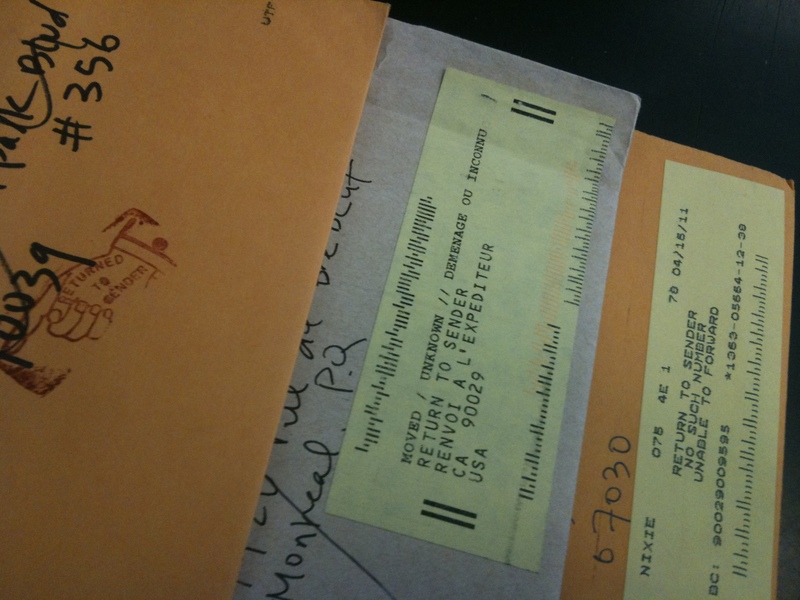 Now what i have to figure out is what do I do with the few envelopes that were returned to sendered to me? Are they OUT. Or can I put them back in? Three of them have wrong addresses on them. I think I can resend them. Also, for those who will want to see everything live and together, I have good news. It looks like there is a great thing cooking up with the West Hollywood Book Fair to show and read what I have gotten back so far in October. More on this later! I’m tucked away at an artist residency right now working on a new graphic novel, but one of the fantastic things about a place like this is that there are many other artists, writers, composers and filmmakers here. And inevitably, over dinner, or over coffee in the morning, you get to talk about stuff. I had the best morning coffee with the fantastic artist Matthew Jensen yesterday, where I was talking about the diaspora, because he did a piece for me while here, and I was forming my strategy for doing my first shop drop. I was going to go into town later to mail my first cards out to the authors and to put my first postcards in their books at bookstores. Also, I was sending a batch of ten postcards to a bookstore back home, hoping that they would slide the cards into the authors books for me. And as hard as it might be to do that. I think Matthew is totally right. It will be so much more awesome to know that whatever cards come back from strangers are actually from people who found it in the book of the person that I sent it to. So, I’m going to stick to the rules. I went to town, mailed off my first cards and then went to the local indie bookstore and attempted my first shop drop. Well, out of the ten authors in my first round , only three authors books were in the bookstore. And I wonder if this is actually a reflection of the percentage of times you will find someones book in a store. Like 3 out of 10 and each time different. I wrote an email to two more people in bookstores to ask if I could recruit their help in shop dropping the cards, and in order to stick with the rules, I wrote them the names of the 10 authors and asked them to tell me which authors books they had and I will mail them only those postcards. One wrote back already, she had 3 out of 10. Interesting. So, this is going to go slow. But slowly, these cards from batch one will find their way around to bookstores in America. And always, if you’re looking to try to find that needle in the haystack, here are some of my fave indie bookstores where there is a great chance a card will be shop dropped in. Last night I set about and ordered my first batch of cards for the diaspora to send out to the writers. I decided to go with MOO as they have the possibility of doing small batches of cards with different images. I’ve used them for my business cards, which I never remember to have on me, but they are mini and cute. I love the way they look. The trick is to make sure that when I’m shop drop the cards into the authors books that it is clear enough to the person that discovers the card nestled in between the pages knows that the card it is an art project. I’m going to self address and stamp the envelopes to go to me, so hopefully that will be the clue that its something that they should mail. And MOO let’s you print a footer, so I printed this. Once again, in a diaspora you have to scatter and let things go. I may never get any of the shop dropped postcards back. C’est la Vie! So, I’ve printed the first 10 images. I scanned them and cropped and I hope that they turn out OK. Also, the post card is quite small, so I’m interested to see what kind of words come back. As a lady who writes pretty lean, I’m not too worried that few words won’t pack a literary punch. 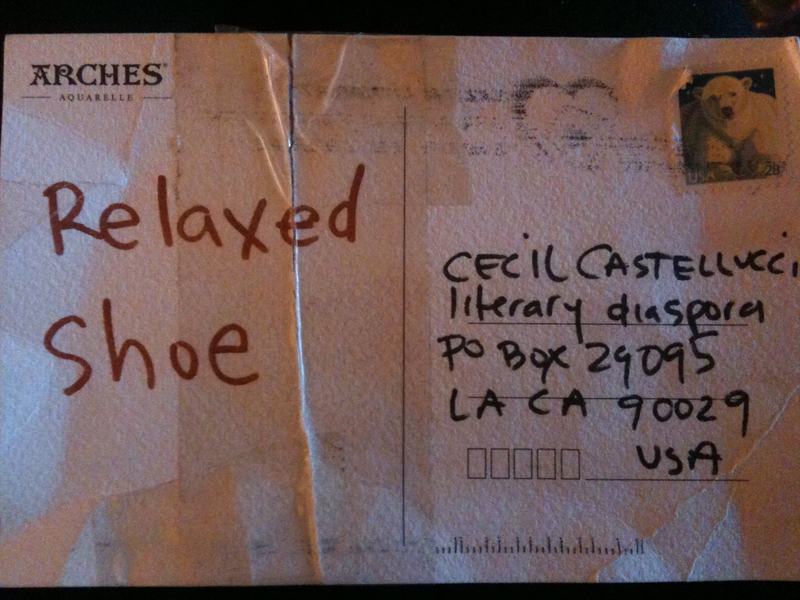 The one postcard that I’m struggling with is Rachel Perry Welty’s. I guess I’m going to have to recreate what she did with the reflective surface. Because the seeing yourself is the best part of that card. Rachel really threw me an artistic curve ball. I love it! If you’ve seen her latest piece, there’s a picture of her in all reflective material with everything wrapped in it. So it’s very her while also being Dark and Stormy. Yay! Art! Next up, I have to recruit some people all over to help me with the shop dropping. My mom sent me a card from Canada and I all of a sudden got worried. I pre-postaged all of my Canadian cards to the Canadian artists I invited to the diaspora because I didn’t want them to have to pay for their own postage. I want to make it as easy as possible for everyone to participate. Trying to find a stamp can be a drag. Anyways, I ordered stamps from Poste Canada. When I did, those stamps were $1.00 to send a card from Canada to the US. But my mom’s letter bore a stamp that said $1.03. Now I am in a panic that all my Canadian cards will never come back to me. I suppose that is the danger of a diapora. The words go. They scatter. Some long to return but they get lost. Or damaged. 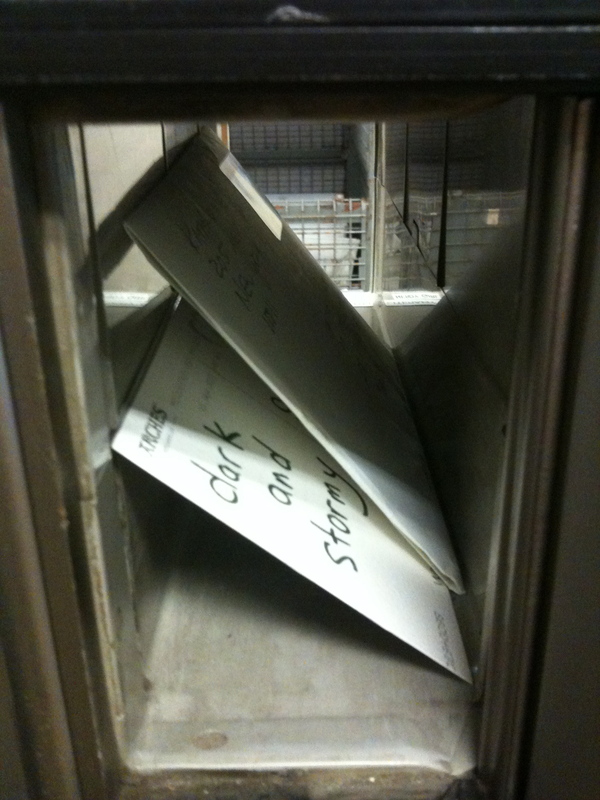 That said, one postcard made it back to me today and it was heavily damaged. It looks as though it was ripped apart in the mail sorting machine. It also looks as though someone in the post office taped it back together so that it would make it on its merry way. Isn’t that always the case? Sometimes you get lost and damaged, but you find a friendly hand to get you back on your way. I actually ‘relaxed’ it. My drawing was in my pocket for a couple days before I sent it off. It was never my intention for it to get creased, but it did. That gave me the idea to embrace it and crumple it up even more. In the process of doing that, it ripped and so needed repairing. Now that shoe is so much more comfortable for having been broken in! I am now at 10 cards returned, which I think is pretty fantastic. I am now getting impatient to have 12. When I have 12 I will print up my first batch of post cards and begin the writerly part of the diaspora. All the while I will still be sending out words to artists. Its sort of a staggered event. Other than that, I can report that Bobby, my post office guy, finds it great fun to put the returned postcards into my po box. And I get a thrill every time there is something in there. I love everything that has returned. I had to go to the post office today. Some of the artists in batch two are from Canada. I want the mailing back of the postcards to be easy, so I actually bought postage stamps from Canada post to put on their postcards. So that meant I had to wait til the postage got here before I could send them off. Today, the Canadian stamps arrived. I don’t go every day to the post office, although I do go there a lot as is my habit, but now it is so exciting when I go to the PO Box. I always wonder, “Will there be something inside?” The past few days it has been sad and empty. But today, when I opened it up, joy! I got two postcards back. One from Kathrin Hilten and one from Rachel Perry Welty, who really helped me when I started. She let me walk through my idea with her so that I could be clear about it. And she has given me my first artistic challenge! The brilliant postcard she sent is a mirror. So basically you see yourself when you look at the card. So now I have to figure out how to recreate that for the 10 postcards I will make. You can offer me suggestions!